Happy Spring all! I cannot believe we are just a few days away from April! 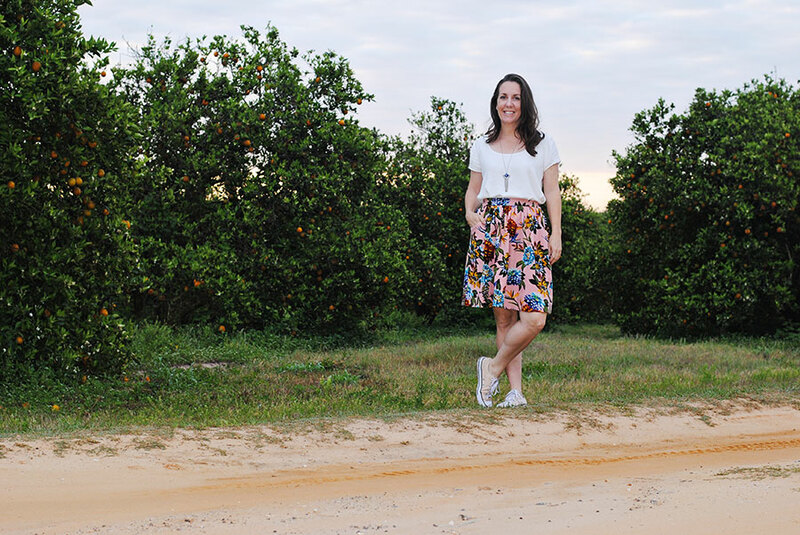 I have a great spring outfit to share with you in some of the most comfortable fabric ever! Let me start with the skirt! I love the linen fabric Fabric Mart carries...this is my third linen order from them (you can see my previous linen makes here and here). But I've never tried any of their linen prints. Over the last couple months, I've noticed a few floral linens popping up on their website! This particular print is out of stock, but they do have a very similar one here. 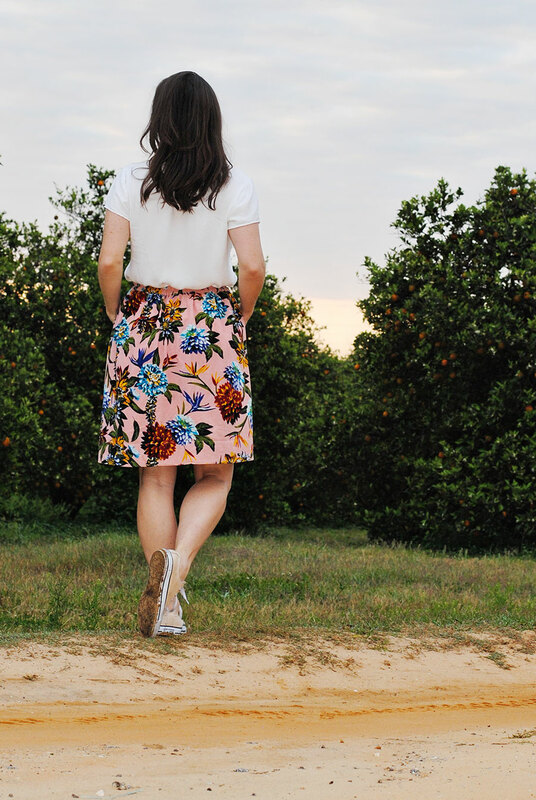 When the linen came in the mail, I knew I wanted to make it into a skirt! I used the Cleo Skirt Pattern (by Made by Rae) to sew this skirt. Made by Rae was one of the first sewing bloggers I knew about, so it's always fun to sew one of her patterns, she knows shat she's doing! The Cleo Skirt comes in two lengths, midi and knee length. I couldn't decide if I wanted a midi skirt length, or above the knee, so I cut out the midi length. After sewing up the pattern, I decided I wanted it to be knee length, so I had quit a bit of extra fabric. I love this happy accident...I had enough fabric to have a nice, deep, three inch hem! I know everyone loves a skirt with pockets and this Cleo Skirt has the best pockets! 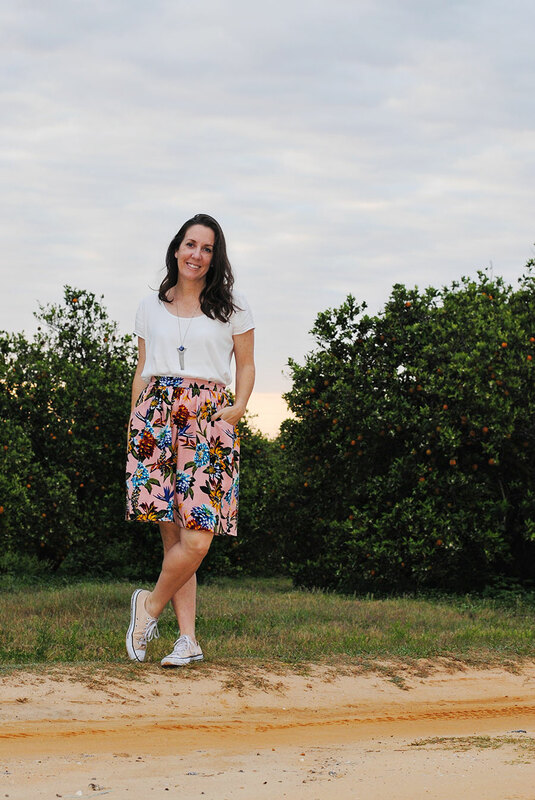 It has a flat front waistband, and elastic in the back, making it a quick and easy sew, but also a crazy comfortable skirt that is so easy to wear! I absolutely love my new skirt! The shirt is one of my oldest indie sewing patterns that I own. It's the Scout Tee by Grainline Studio. It has been years since I have sewn it, and I forgot how much I love it! I sewed this one up in rayon crepe challis fabric. This fabric is pretty sheer, so I went ahead and doubled up the fabric on every pattern piece. This rayon crepe is so incredibly soft. I would say it feels very similar to double gauze (speaking of softness) but has the drape of rayon! It's great fabric...and I'm thrilled to have a basic white tee (in woven fabric) that I can wear with just about anything! Thank you Fabric Mart for the beautiful fabric! What sewing plans do you all have in store? That's a great Spring outfit! 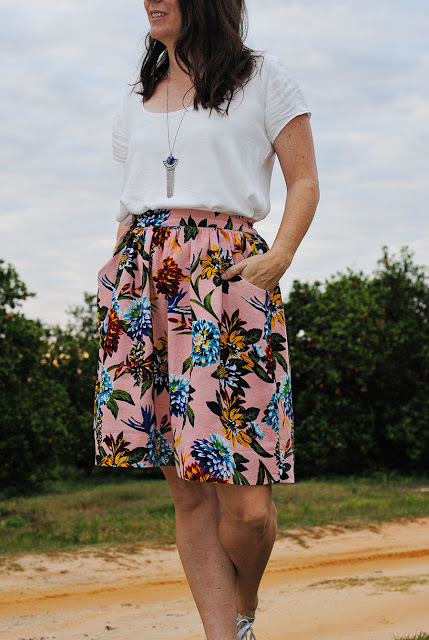 Your skirt looks so comfortable, yet very feminine with the pink floral. I too love Fabric Mart's linen. 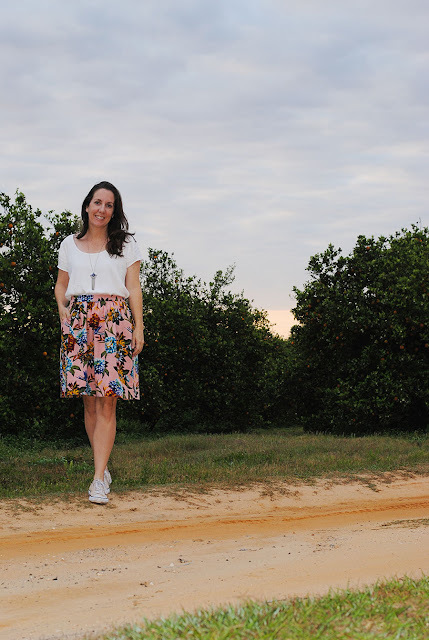 I got several pieces of the printed linen and they are perfect for skirts! Made by a Fabricista: Spring Sewing!